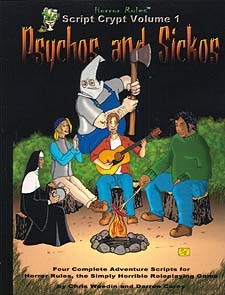 All the Axe-Wielding Homicidal Fun You Can Handle! * 4 Spinetingling Horror Rules Adventure Scripts! * 13 Reusable Bad Guys! * Walk-0ns, Plot Pushers & Maps! * Loads of Sequel Suggestions and Plot Twists - 16 bonus Adventures in all!